Sweden’s Prime Minister Stefan Löfven announced on Friday that the Government will open an embassy in Tunisia. 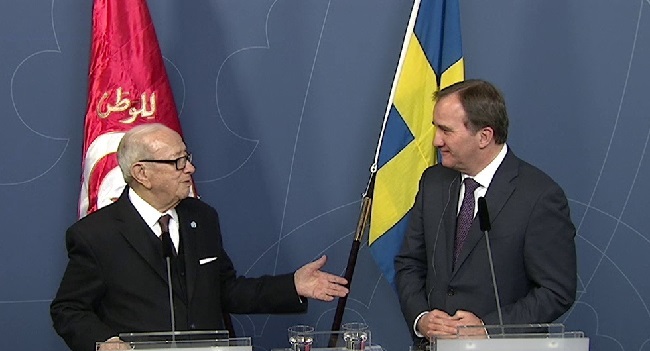 The news was presented during talks with Tunisian President Béji Caïd Essebsi, on a state visit to Sweden. “Tunisia is the North African country where the Arab Spring brought democracy, and the positive developments in the country continue to inspire. Reopening our embassy in Tunis will give us the opportunity to contribute to the country’s democratic consolidation on the ground and deepen our bilateral cooperation,” says Mr Löfven. The previous embassy in Tunis was closed in 2001. Since then, a Stockholm-based ambassador has been accredited. The aim of reopening the embassy is to strengthen trade promotion as well as to further develop the political dialogue and follow-up of efforts for human rights and democratic development. The business sector would like to see a Swedish presence in Tunisia so as to promote trade and investment. At present, Swedish companies employ around 5 000 people in the country. The potential for increased Swedish exports is growing as the Tunisian market becomes more stable following the 2011 Jasmine Revolution. There is substantial interest in Swedish solutions and social models in Tunisia. Sweden and Tunisia also share common challenges such as regional security policy issues and migration. The presence of an embassy will facilitate bilateral cooperation on these issues.